If your kids have unadventurous palates, you may find yourself making a lot of mac and cheese. Sometimes, we make a big pot of homemade mac and cheese with Velveeta and then change up the leftovers. Want something different, but delicious? 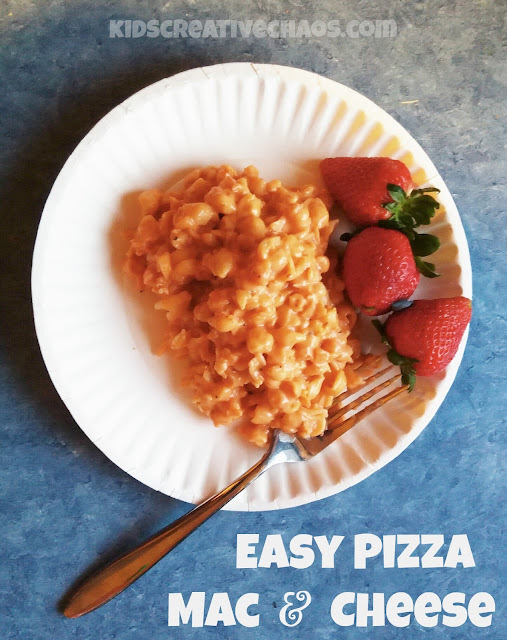 Make easy homemade pizza mac and cheese with this recipe. Enjoy! Pizza Mac and Cheese Recipe. The day after mac and cheese usually requires some freshening up. My daughter says "it's frozen" when she sees it hard and congealed. The best way to doctor leftover mac and cheese is to place it over low heat on the stovetop and stir in milk until desired consistency. Cups pizza or spaghetti sauce. Don't add too much or it will taste like spaghetti soup. It should look orange and creamy (see picture). Add pepperoni or sausage if desired. Add a cup of Mozzerella Cheese. Stir in a pinch of salt and pepper to taste. Next, add a dash of Oregano to desired taste. Keep stirring over low heat until heated through. Plate out, and sprinkle on the Parmesan.